When I joined the real estate startup, REX, in social media and content marketing, they had the beginnings of a social presence and were producing content for a monthly newsletter. My role focused on developing the company’s social and content strategy, defining how we would treat each channel, how we would message, create reputation, invite interaction, listen to the market and engage with people. As a startup we had limited funds and most of the budgets were being invested in the product, systems or being spent on direct response channels. But we had an appetite for testing and learning- and dipping our toe into influencer marketing was certainly on our growth list. One of my favorite projects was a collaboration with an agency in LA called Zig Marketing. After a few meetings, and learning about our business, they pitched ideas to expand our brand awareness with influencer marketing. Zig specializes in building relationships between brands and bloggers, developing an outreach strategy, designing unique campaigns and implementing. They brought some interesting ideas but I didn’t think I could sell them internally. I knew I couldn’t ask the agency for a guaranteed return on investment- but I knew that’s what my management would be asking me. Tinkering with Zig’s ideas, I was able to find a creative way to limit our financial exposure at worst, make the program net neutral (our expectation) or, at best, be ROI positive. The campaign we designed would have the agency sending proposals to 25 prominent bloggers who write for our target audience (potential home sellers in Southern California). To qualify, the agency reached out to bloggers they new and researched/connected with new blogs that fit the profile we defined together. The proposal asked if the blogger would be interested in working with REX on an experiment where the blogger would find a home-seller in their reader base and follow the process of selling a home with REX. It seemed brave to open ourselves and our process up to a journalist. As a new company our operating processes were changing daily and being optimized based on customer feedback. But we wanted the content that the bloggers created to be real and show how REX sells homes just as well as a traditional agents, better actually, but charging 60% less in commission. If this marketing program could deliver 1 customer to go through this blogger-documented selling process, it would pay for itself and be net neutral. That I could sell to my management. The program would generate hundreds of thousands of brand impressions, posts, shares, comments, likes, and discussions- all great at building reputation but not exactly measurable. Yes, I have direct response in my DNA- after 10 years of cost-per-lead marketing, who wouldn’t. But that’s not why this was my favorite project. Having a writer detail the process of selling with REX from the client’s perspective would be such an interesting story. Selling a house is one of the biggest financial decisions a person will make and the process is infinitely complicated. REX is a David in a David and Goliath scenario. As a company disrupting the traditional real estate market, REX has a big story to tell and lots of antagonists who don’t want the industry to change. Was I concerned that the process might break down somewhere in selling this house? Sure. Every agent has stories to tell about impossible situations. But we decided the risk was worth it. We didn’t know what client might sign up for this process, if their home would be easy to sell or if they would be reasonable on selling price. But we knew that even a bumpy story would show our strengths and humanity. Two bloggers received our proposal and instantly understood why we created REX and why the real estate industry and their readers needed to know about what we were doing. Working with Zig Marketing they picked the angle of the REX story that interested them and would interest their readers. We didn’t tell them what to write and we definitely didn’t require any specific content. That would be overstepping the process and be disrespectful to the blogger. We had gotten a great break when Bloomberg Pursuits covered us the month before, but when we were written about by Someday I’ll Learn and SoCal Field Trips, it felt different. It felt like we had lit the match in the communities where we’re creating relationships- where we have billboards, where we have homes for sale, and where we are targeting digital marketing. These articles were posted just a couple weeks ago, so we don’t have results yet. We are anticipating some traction from this and so far this project has been a great way to dip our toes into influencer marketing. 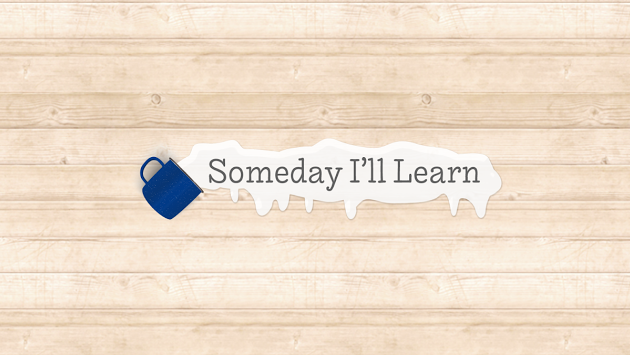 Bloggers Nate and Chelsea create a fantastic blog called Someday I’ll Learn which takes you along on their adventurous activities with four boys. Chelsea is a marketing consultant and writer and Nate is a photographer and do-it-yourselfer. They run their businesses from their farmhouse in Southern California. Jilleen Butler is the founder, blogger and field trip coordinator behind SoCal Field Trips. 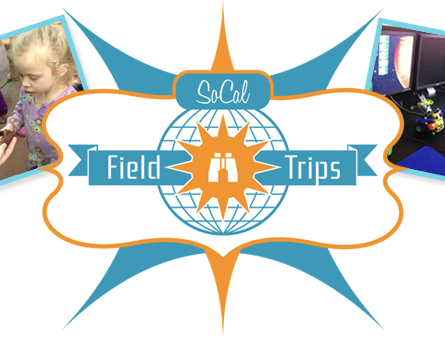 SoCal Field Trips is a lifestyle blog dedicated to active families who enjoy adventuring out of the home and into the world of hands-on learning. Jilleen offers a unique perspective to thousands of families in Southern California. As a senior digital marketing expert at Medtronic Diabetes I was drafted to a new team within the organization focused on developing thought leadership content to attract the audiences we knew we wanted to address (physicians, scientists, engineers, investors, global experts, etc). Up until this point I was working with a team to attract potential customers (the users of insulin pumps) and win back previous customers. So this was a new venture with an entirely new mindset. It has become pretty obvious that the role of digital advertising has been changing and decreasing in effectiveness as consumers develop banner blindness, ad blocking technologies become easier to install in your browser and more money is piling into online from offline. Content Marketing has become more critical as a way to introduce yourself to your customer months before they know they might be your customer. But it takes a well honed strategy, a detailed understanding of your brand voice and customer personas, a plan for lead nurturing, content development experts, and tools to provide analytics. We certainly had our challenges. We were concerned about gaining executive commitment for monthly content. We were only a team of 3 and wanted to recruit author/experts from across the company, but would that leave us vulnerable to employee poaching? And, of course, we have significant regulatory oversight and were not able to talk about product development, our competitive advantages or product-specific information without providing pages of disclaimer and safety copy. Our workflow consisted of an online marketing communications approval system that routed projects through no less than 4 reviewers, usually 8 were required, and took a minimum of 2 weeks. Create from a global perspective so that content created in the US could be extended to our marketing teams in the other regions. 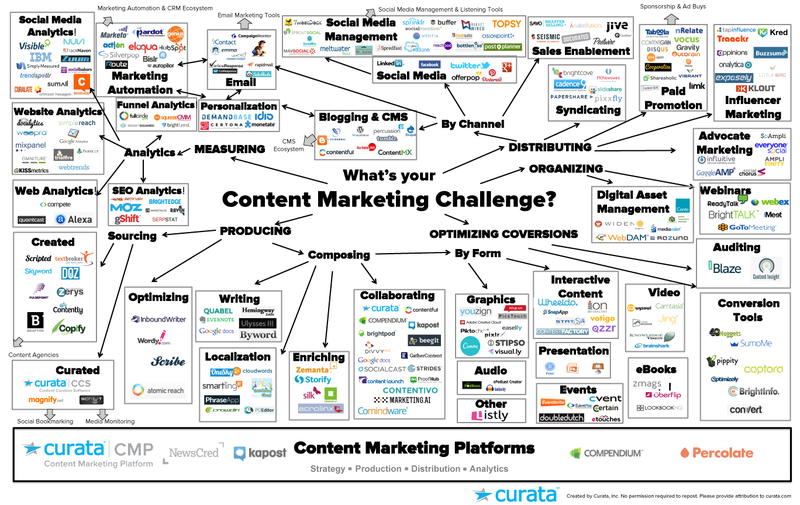 There is a sea of content development applications that allow brands to create, source, syndicate, publish, and measure performance of content. As you can see in the graphic below, there’s a tool for practically everything. If you don’t identify what your specific needs and priorities are, you could easily go down a rabbit hole. I reviewed tools to help create content assets, platforms where you can publish assignments and find authors, collaboration tools allowing you to team think and edit, and so much more. In my next posts I will review some of the the tools I found, which ones I found valuable and the outcome. Life on the maternity ward has definitely changed since Facebook. Ever notice how you can spend hours on FB and look up and it’s midnight? That same bliss is ever-useful to distract you from contractions too. Since you’re about to be a new Mom (or Dad) and you’ll probably be in radio silence for at least a couple days to six months, Zuckerberg has perfect timing. 1. Expand your network- make sure all your friends, family and anyone who might miss you over the next few years know you are about to be sucked into parenthood. Getting them all on Facebook makes maintaining all these relationships easy. This also means your parents, uncles, aunts and people who claim, “Oh I’m too old for that”. Lure them with baby pictures to be posted on FB only! You’re about to go into a new-baby cocoon where you barely have time to eat and shower- if they want to hear from you they need to get on board with Facebook. 2. Send last minute status updates so everyone knows where you are and when this is likely to go down. Important: Be sure to let everyone know that your hubby will call them or send a status update when it’s a good time to visit. I recommend you mention you will ‘schedule visits’. It’s pretty hard to be a new mom, get used to nursing, doctor/nurse visits and juggle 3 sets of relatives in a small hospital room when baby is fussy. Use a schedule to set time with visitors and give yourself blocks of time for naps and rest. 3. Download Facebook to your smartphone. That way when your darling baby is born you can upload their picture straight to FB for all your family and friends to see. No mess, no fuss. Having FB on your phone will also be great as you’re walking the halls of the delivery floor trying to get through early contractions. Remember that distraction breathing exercise from birthing class? Viewing your friend’s adorable baby photos from their albums might just do the same thing. 4. Have all your friends suggest a calming song to add to your birthing playlist. 5. And last, don’t second guess the baby names you have picked out. But if you’ve procrastinated or changed your minds, check out the GoodToKnow Baby Names Generator or Baby Names Finder from PajamaBaby.com. Good luck Mom and Dad!